The office of King's Printer could be seen as conferring many advantages. Not only did it bring with it an annual stipend but it gave the office holder the exclusive right to print statutes, proclamations and other official material, as well as, in many instances, certain religious items such as Bibles and prayerbooks. The government had been quick to see the value of using the press to ensure that accurately duplicated copies of official pronouncements could be speedily prepared without being dependent on the vagaries and inaccuracies of individual scribes. As early as 1503 William Fawkes is described as "regius impressor". He was succeeded by Richard Pynson in 1508 and Thomas Berthelet received the royal patent in 1529. In the 1570s the privilege was granted to Christopher Barker in whose family it was to remain for almost a century, with the interruption of the Commonwealth. Of course a down side of the position was that, during times of war, the King's Printer might be asked to accompany the sovereign and run the risk of ending up as a prominent figure on the losing side. It was the Civil War that brought the first known active printing press to Exeter, there being no evidence that John Williams had actually used his press in Exeter in the previous century. The King's Printers had taken two presses to York in March 1642 and stayed there until September, during which time they printed at least 78 items. They then moved to Shrewsbury where they remained until at least August 1643, printing at least 96 items. The bulk of these items is listed in A catalogue of such of His Majesties works as have been printed at York, and Shrewsbury by His Majesty's Printer, since the 26 of March, 1642 unto this present, the last item listed being dated 10 August 1643. This shows an average of some ten items a month issuing from the press, although not all survive. Unfortunately no similar lists exist for the next port of call, Bristol where the printers are known to have been active from at leat November 1643 to September 1645. On 11 September Prince Rupert surrendered Bristol the to Parliamentary forces under terms which allowed Prince Rupert, his soldiers, wounded and others, including the King's Printers, safe conduct to leave the city with colours flying. The journey must have been completed and the press set up with some despatch as soon after 20 September a single folio sheet bearing that date issued from the press. It starts "George Lord Goring, Generall of all His Majesty's forces of horses that are or shall be raised ...". This is the first of only five surviving items printed in Exeter before the city surrendered to the Parliamentary forces in April 1646. As Exeter was under close siege from the end of October there may have been little printing undertaken but three other pieces of offical Exeter printing are known. The first is Certain prayers fitted to severall occasions. To be used in His Majesties armies, and garrisons. Published by His Highnesse command (1645). The second is A copy of a petition commended to the peace-making association in the West, by Colonell Blake, and Colonell Pyne, to be subscribed and presented by them to Sir Thomas Fairfax (1645). The British Library's copy of this is dated in manuscript "About 30th September". The third item A proclamation for all persons within our quarters in the county of Devon able to bear arms, not being otherwise imployed by His Highnesse, or dispenced withall, to attend His Highnesse now advancing in person to meet the rebels was made by Prince Charles at his court in Tavistock on 29 December 1645 and is the latest dated item to be printed in Exeter before the surrender. The Prince must have been optimistic that this procamation would receive wide distribution as it contains the injunction that "the high-sheriffe of Devon is to cause this our declaration and proclamation to be speedily publisht in all market-towns and publike meetings in our quarters there, and read in churches and chappels within the said county, we having directed the like to be done in our Duchy of Cornwall, and hereby directing the like to be done in the City of Exeter." This implies the publication of a separate proclamation for Cornwall which has not survived, and a print run of some 500 copies would have been required to supply all accessible Devon parishes and meeting places in market towns. It is not known where in Exeter the press was located but it is traditionally said to have been in St Nicholas Priory. The products of the King's Printers, whether in York, Shrewsbury or Exeter have distinctive title-pages so that they would be easily recognisable as the work of the royal press. The title-page is normally enclosed in rules and outside these is a border made up of printer's flowers in the form of acorns. When space permitted there was also below the title and above the imprint a row of four printer's flowers with a rose, a thistle, a leek and a harp, each surmounted by a crown, symolising the four countries which made up the kingdom. Beside this the printers had a good collection of factotum blocks, woodcut initials and decorative head and tail pieces as well as a range of display types and a black-letter font. The imprint for official items in Bristol and Exeter normally reads "Printed by Robert Barker and John Bill, printers to the King's most excellent Majesty". In fact the member of the Barker family who may have been present at Exeter was more likely to have been Christopher Barker III the great grandson of the Christopher Barker who was the original recipent of the patent, his father having died and his grandfather having been imprisoned for debt and dying in the course of 1645. John Bill, who was certainly in Exeter, was the son of John, who had entered into partnership with Robert Barker in or before 1615. (Sessions 1982). There was also an interesting item of unofficial printing, a tiny duodecimo of some 260 pages distinguised by its different form of imprint: Exeter, printed for Thomas Hunt 1645. Thomas Hunt was an Exeter bookseller who had aleady had at least two works printed for him in London and the work in question was Good thoughts in bad times by Thomas Fuller (1608-61), better known as the author of the Worthies of England, who was in Exeter as chaplain to Henrietta Maria. The work is dedicated to Lady Dalkeith, the governess of the infant Princess Henrietta Anne, daughter of Henrietta Maria and Charles I. Henrietta Maria had fled Exeter for France two weeks after giving birth to Henrietta Anne on 16 June 1644, leaving the infant in the charge of Lady Dalkeith who was allowed to take her out of the city unmolested when it surrendered in April 1646. Lady Dalkeith was asked to "accept these grapes, if not for their goodnesse, for their novelty: though not sweetest rellisht, they are soonest ripe, being the first fruits of Exeter presse, presented unto you." John Bill surrendered in Truro in March 1646 so he may have left his presses in Exeter before the final surrender on 13 April. When he begged to compound with the Parliamentary Committee on 18 April it was stated that he had been a major of a horse regiment under Lord Hopton for which he was fined on 18 September. On 24 October the Committee for Compounding with Delinquents ordered "that two printing presses with type, part of the personal estate given in by Bill to be compounded for, - which were formerly sent to York, thence to Exeter, and after its reduction, there sold for 20l. by consent of the County Committee for Devon, to Ecclesfield, bookseller of London, but retained by another committee of Exeter, in whose hands they now are, - be delivered to Ecclesfield, Bill confirming that he has agreed with him for the same." Ecclesfield was Francis Eglesfield, who had many links with Westcountry boooksellers and was involved in a number of joint publications. It is puzzling what his interest would be in purchasing two travel-worn presses in a remote city when at the Marigold in St. Paul's Churchyard he was surrounded by printers, unless it was to keep them in Exeter to print works locally, feeling that he could do his in the less controlled atmosphere after the abolition of the Court of Star Chamber in 1641 and before the "Act for the better regulating of printing" of 1649. A possible candidate for such printing is Practicall law, controlling and countermanding the common law which bears the imprint "Printed at Exeter, 1648". In the same year a much more notable work appeared in London which shows that perhaps Eglesfield had given up any idea he may have had of establishing a regional printing centre. The imprint reads: "London, Printed for John Williams, and Fancis Eglesfield, and are to be sold by Tho: Hunt, book-seller in Exon, and the title is Hesperides or the works both humane & divine of Robert Herrick Esq. the vicar of Dean Prior in Devon. (Sessions 1982). "So far as we know at present the first resident printer does not appear in the city until 1683 and we do not know his name. ... Since 1683 the city has never lacked a resident printer ..." Thus W.G.Hoskins in Two thousand years in Exeter. He goes on to say that the first whose name is known for certain is Samuel Darker in 1698, noting that a printer with the initials J.B. printed for William of Orange in 1688 and that he is thought to be one John Baker. His statement has been widely accepted.Apart from a clutch of items in 1688-89 there are no other Exeter imprints between 1683 and 1698 when six items by Samuel Darker are recorded. Michael Dickinson, using the evidence of apprenticeship indentures, states (Dickinson 1963) that "the anonymous indentures, printed at least as far back as 1682 are so similar to those printed by Samuel Darker for two different booksellers in 1698, that he, or an unknown predecesor must have produced them." Nevertheless there are few grounds for believing them to have been printed in Exeter. In the 1680s and 1690s Exeter booksellers were having books printed for them in London and it is almost certain that they would have acquired apprenticeship indentures there too. In fact there is a very good reason for there being no printer in Exeter before 1698 and that is the Licensing Act of 1662. This was in force until it was allowed to lapse in 1695 except for a gap between 1679 and 1685 when no advantage appears to have been taken of this loophole by provincial printers. The severe restrictions it placed on the book trade effectively limited printing to London, Oxford, Cambridge and York. 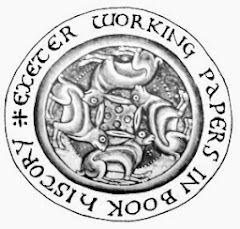 The claim that there was a permanent press in Exeter since 1683 seems to originate in a 1683 Exeter imprint recorded by Davidson (1852, 97) A resolution, with the advice of the Bishop of Exeter to give for the beautifying of the chapel in the castle of Exeter £10 ... This title has not been located but there exists a folio broadsheet printed in 1683 which contains a similar passage: "... We Order, Resolve, and Agree, with the Advice and Concurrence of the Right Reverend Father in God, our most Honoured and Worthy Lord BISHOP, to give and bestow for the Beautifying of the Chappel in the Castle of EXON, and for the erecting of decent seats there, Ten pounds: And we will likewise give and continue Six pounds to be paid yearly to anyone of the Church of Exon, whom the sd Lord BISHOP shall appoint, to read the DIVINE SERVICE, with the prayers lately appointed for the day of Thanksgiving on the Ninth of September last, and to preach a sermon exhorting to OBEDIENCE, in the said Chappel, ..." This is hidden after 43 lines of text and demonstrates that the title recorded by Davidson was in fact a concocted one. The first words of the broadsheet are: "Devon ss. Ad General. Quarterial. Session. Pacis Dom. Regis tent. apud Castr. Exon. in & pro Comitat. praed. Secundo die Octobris, Anno Regni Dom. nostri Caroli Secundi ... Tricesimo quinto, Annoque Dom. 1683." This clearly identifies it as a resolution of the Devon Quarter Sessions passed on 2 October 1683 and it is in fact listed under the first words of the title as entry D1231 in Donald Wing's A short-title catalogue of books printed in England, Scotland and Ireland ... 1641-1700. The first edition of Wing gives the following item, D1232, as a later edition issued in 1685. This is corrected in the second edition. The 1685 edition is a similar proclamation but referring to the Monmouth Rebellion. "That the continued Care of His Majesties Justices of the Peace for the County of DEVON, for the Safety of His Majesties Sacred Person, the preservation of Publick Peace, and the advancement of true Religion, may be fuller known, and have a better effect; I do hereby Order and Require all the CLERGY of my Diocess within the County of Devon, deliberately to publish this order, the next Sunday after it shall be tendred to them. The requirement for the order to be displayed in each parish clearly required the printing of several hundred copies and, there being then no printer in Exeter, James Cottrell of London (the J.C. of the imprint) was approached. James Cottrell or his partner Freeman Collins had already printed at least one item for Exeter booksellers: A true and impartial account of the informations against three witches, viz. Temperance Lloyd, Mary Trembles, and Susanna Edwards, who were indicted, arraigned and convicted at the assizes holden for the county of Devon at the castle of Exon, Aug. 14, 1682. With their several confessions ... This was sold by T.Benskin in London and Charles Yeo in Exeter. An essay on hypocrisie was also printed by Cottrell and Collins for Charles Yeo in 1683. The full text of the 1683 resolution is of interest in showing the wild excesses of suspicion against Dissenters after the Rye House plot. The text is taken verbatim from the Devon Quarter Sessions order book where the marginal heading "Rye House Plot" is used. This is not mentioned in the printed version which refers simply to the "late Horrid PLOT". In order to secure the King and Government from the "Fury and Malice of 'em" they resolved to require sureties for "the good Abearing and Peaceable Behaviour" from any person suspected of disloyal acts, whether frequenting conventicles or by utterances against the established government. They identified a "sort of false Men, and more perfidious than professed Phanatiques" who secretly associated with seditious clubs and "sometime appear in the Church with a false shew of Conformity, only to save their money". Churchwardens and constables were to give an account to the justices of "all such as do not every Sunday resort to their own Parish-Churches, and are not at the beginning of Divine Service, and do not behave themselves Orderly and Soberly there". Constables were to seize all Nonconformist preachers who had refused to take the oath that they did not hold it lawful to take up arms againt the King. As an encouragement they were to be paid forty shillings. Thus dissenters joined vermin in having a price on their heads. While the dissenting ministers were being thus persecuted the justices could enjoy the improved seating in the Castle Chapel and listen to the sermon on obedience. That part of the resolution was speedily acted upon for the Term Catalogue for Trinity Term 1684 advertises The original of wars, or the cause of rebellion. A sermon preach'd, in the Castle of Exon., Jan. 15th 1683, before the Right Reverend Father in God, Thomas, Lord Bishop of Exon; and other His Majesties Justices of the Peace for the county of Devon. By Tho. Long, Prebendary of St. Peter's, Exon. This was printed by James Cottrell and Freeman Collins for Daniel Brown, to be sold by Walter Davies. No Exeter bookseller is mentioned. The publication of the 1683 resolution must have been satisfactory as the justices aproached Freeman Collins two years later at the time of the Monmouth Rebellion to print the 1685 proclamation referred to above. Such publication of the proceedings of the Quarter Sessions seems to have been a purely Devonian initiative in the region as no similar items appear to be recorded for other counties in the south west in Wing's catalogue for the later seventeenth century. There is another link with Exeter which, although it cannot make Collins the first resident printer in Exeter, may make him the first Exeter printer in a different sense. Collins became a freeman of the Stationers' Company on 6 March 1676, subsequently became a liveryman on 8 May 1683, and later rose to higher office in the Company, serving as Upper Warden in 1710 and 1712. He was partner with James Cottrell in the Black and White Court in the Old Bailey and married his daughter Susannah in May 1678. He bound seventeen apprentices and enjoyed considerable esteem in the City of London, being known as Deputy Collins because of his position as deputy alderman. Freeman Collins was born in about 1653, and when he was bound to Thomas Newcombe, citizen and Stationer of London, on 1 March 1669 he was described as the son of Thomas Collins of Exeter clerk. Thus the man who printed these early items for the county of Devon was in fact an Exonian. He later became involved with a provincial printing house, but in Norwich, not in Exeter. Nevertheless he maintained his links with his native city, printing works for Exeter booksellers in 1684, 1696, 1697 and 1701. He died in 1713, leaving an estate valued at just over £1,500, two thirds of which went to his widow and successor Susannah. The general association of the gentlemen of Devon to His Highness the Prince of Orange. Exon: Printed in the year 1688. (Wing G488b). This has the misprint "Almlghty" in line 6. The Prince of Orange's letter to the King. Exon: Printed 1689. (Wing W2354). There are two settings, one starting "HOW" and the other "HOVV". The Prince of Orange's speech to the Lords. Printed at Exeter , 1689. Known to have been printed at Exeter are impeachments of high treason against the Lord Chancellor and the Lord Chief Justice described in a letter to Lord Preston dated 5 December 1688. An epistle to Mr. Dryden. Wing (E3166) gives the imprint [London, 1688], Burnet Morris records a copy with an Exeter imprint. The authorship is ascribed to Thomas Rymer. A modest vindication of the petition of the Lords spiritual and temporal for the calling of a free parliament. (Wing N2376). Dated "Exeter, Nov.21.88" but not necessarily printed there. A letter, &c. Gentlemen and friends, we have given ... (Wing O12). Signed W.H.P.O. William of Orange almost certainly had the services of a printer in Exeter in 1688. In view of the illegality of any press in Exeter in 1688 we would have to look to London for an appropriate printer. There is a 1686 list of London printers in the archives of the Stationers' Company (Treadwell 1987, 161). This includes only two printers with the initials J.B. The first is Joseph Bennet who died in February 1692. He often printed for L'Estrange and, while not necessarily himself a Catholic, he trained almost all those printers identified as Catholic in the next generation. He is scarcely a good candidate for the printer to the Protestant Prince of Orange. The other printer looks no more promising as his name is deleted in the list. He is John Bringhurst, a Quaker, who printed extensively for the Friends between 1681 and 1685, at which date he disappears. In the Treasury records at the Public Record Office there is a significant entry in the register of the discharge of Post Office debts for the year ended Lady Day 1686. This is for Bringhurst, printer, Gracechurch Street, the receiver of 494 unpaid letters, and it is noted that he had gone to Pennsylvania (Calendar of Treasury Books, 8:3, 1673). This may have been a deliberately misleading statement for he had been in touble with the authorities shortly before that date. In 1683 he had been imprisoned after the publication of Fox's Primer and in the following year he was pilloried (Mortimer, 109-10). Certainly he is known to be in Holland in June 1688 when on the 4th of that month the death by consumption of John, aged 5, the son of John Bringhurst, printer in Holland is recorded in the Quaker burial registers at Friends House. The birth of this son is recorded in 1683; the mother was Rosina, the widow of John Materne of Edmonton, who married Bringhurst on 27 July 1682. William was advised by Harbord to bring a press with him. The memorial of Admiral Herbert, Sept-Oct 1688 says "I shall referre in many things to Mr Harbord's project and begin with a printing presse (Japikse, v. 2, 611). Additionally as it was uncertain where William would land, it would be highly coincidental if he found a press awaiting him in the nearest large town. A likely course of events is that William's aides found Bringhurst in Holland and arranged for him to accompany the expedition as printer. Whether the press remained in Exeter or went on with William to London it is difficult to say. There is a tradition that the press was installed before the fireplace in the drawing room at Sherborne Castle where William stayed for three days and it was used to print William's third declaration. Visitors are still shown the hearth stone cracked by the weight of the press. The problem with this story is a letter written by Gilbert Burnet which is found in British Library Harleian Ms. 6798 art. 49. The letter is confusingly dated "Vendredy à midi 29th Novbre, 1688". Friday was in fact the 30 November. The confusion is made worse by its heading: "Lettre de M. le Docteur Burnet, de lundy jusqu'au jeudy 26 novembre 1688. Escrite à diverses reprises selon que j'ai eu le loisir." The most like explanation was that the letter was written between Monday 26 and Thursday 29 November, during most of which time the Prince's contingent was at Sherborne, with the final flourish being added on the Friday. In it Burnet appears to be lamenting the lack of a press: "Une presse nous feroit icy plus de service qu'un Regiment; on ne sauroit fournir à faire des Copies; et le monde est fait d'une manière que s'il ne void des imprimés, il n'ajoute pas foy aux choses les plus autorisées et les plus certaines." In addition William's third declaration, although dated from Sherborne Castle on 28 November, is now generally considered to be a fabrication (Cal. State Papers Domestic, 365). Among others Hugh Speke claimed to be the writer of it and to have arranged for its printing in London. Clough (1969) lists no items printed at Sherborne. The possibility of the press remaining in Exeter for a few months is suggested by the existence of items dated 1689. One, the General association, is a reset printing of the 1688 edition, correcting the misprint "Almlghty" in line 6. This is not proof positive however as the items could have been postdated, but if J.B. did remain in Exeter it was not for long. There are no further surviving Exeter imprints and in 1693 the Exeter bookseller Michael Hyde used a London printer to produce a sermon preached by John Bush in Exeter. If there was a printer in Exeter at that date he would probably have employed him. According to Mortimer Bringhurst "reappears in London but for a short glimpse (1690) before his death (presumed about 1699)". Typographical evidence is inconclusive. Derek Nuttall finds little continental influence in the type stock of the Exeter printer but feels that he may have received a supply of type while he was at Exeter, perhaps from Oxford. However all the foregoing is circumstantial evidence and no mention of Bringhurst's name has yet been found in connection with William's expedition. Thus, apart from the printer with the initials JB, who passed briefly through the city in 1688 in the train of William of Orange, there was almost certaintly no printer in Exeter until 1698. So it is now known that Exeter had to face the problems of the lack of a local printing press for fifteen years longer than was previously thought. This sheds a new light on the effectiveness of communications during the turbulent events of the late eighteenth century. But for those attached to the conspiracy theory of history the possibility remains that from the 1560s onward there could have been at least one printing press, and from the 1640s perhaps as many as three, permanently in Exeter. Remote from the clutches of the Stationers' Company, the Court of Star Chamber and later the licensing authorities, could they have been used from time to time for the odd piece of clandestine printing? Did Bringhurst in fact know that there was a press lying idle - or not so idle - in Exeter when he landed with William of Orange at Torbay?